We're very excited about our newest specialty card set for HISTORY MAKER BASEBALL Big League Baseball Board Game, NOW AVAILABLE: The Cooperstown Cards! As the title suggests, this will be a collection of baseball hall-of-famers—TWO collections, actually! 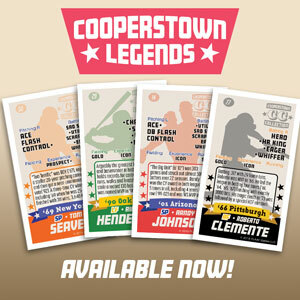 The "Cooperstown Legends" set is the first release, featuring players whose careers began in 1930 or later. A second set of of enshrined players, our "Cooperstown Pioneers" set, will be released around April of next year, with players whose careers began before 1930. Together, they'll represent baseball's most-honored players in a fun, accessible, engaging way! As you can see (illustration at right) we've created an all-new card style for this collection, distinctive and elegant. Each card will be sequentially numbered, based on a key year for the player, and will include a two or three line synopsis of his career--similar to a classic baseball card! These cards will also have all the necessary HMB player attributes to produce realistic, exciting, classic baseball action on your tabletop! Perfect for an easy-going afternoon of tabletop baseball, either by yourself or with friends! Match the greatest players in baseball history against one another in "Field of Dreams" games that YOU set up! Or, enjoy the cards for their historical merit, the same way you'd enjoy a set of baseball trading cards. Either way, the Cooperstown Legends and Pioneers Collections will make a great addition to your baseball sports game hobby. And since you can't have a ball game without umpires, The Cooperstown Legends set also includes cards for enshrined umpires! Designed with the same "look" as the player cards, each umpire card contains a quick career bio and the appropriate umpire ratings for use with the game. The Cooperstown Legends set is offered for $29 postage-paid* and includes 130 ball players enshrined as baseball's most-honored, along with a set of 14 hall-of-fame umpires to oversee the action! Order YOUR copy!